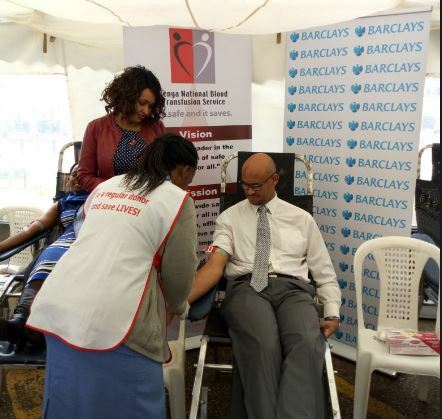 Barclays Bank MD Jeremy Awori donating blood. One of the purest things one can do for humanity is to help without expecting any help back, and what better place to start than giving life through blood donation. This is an exercise that many people have shunned, only showing up in hospitals to donate when a loved one is specifically in need of blood. You may not think about it but on any given day, there is need for blood for transfusion in our hospitals. With the high number of accidents that sometimes plague our roads to our not too impressive maternal and infant mortality statistics, donating blood is a crucial exercise that is quietly saving lives. Not forgetting the number of people under treatment for life threatening diseases like cancer and sickle cell anaemia among others who will need transfusion at some points or other during their treatment. The sad reality is that in Kenya we have a serious deficit in our blood banks under the Kenya National Blood Transfusion Services (KNBTS), an organization that is mandated with collection, testing and distribution of donated blood and blood products to transfusing hospitals in the country. With an annual requirement of more than 400,000 units of blood needed in the country for example, we have a shortage of about 250,000! That is a sad scenario and for a procedure that takes just 15 minutes, anyone who is in a position to do something should certainly consider helping. As mentioned earlier, giving without expecting to be given anything back is one of the purest things one can do for fellow human beings. Meet Alpha Sanya Kennedy for example, the public prosecutor at Nakuru County and the highest male blood donor in Kenya. Sanya begun donating blood in 1983 and has continued to do so to date through the Kenya National Blood Transfusion Services(KNBTS). While going about his duties in Nakuru, he has come face to face with the reality of the need for blood owing to the number of accidents that take place on the highway, going into and out of Nakuru. He has seen many incidents where accident victims needed blood to survive, an experience that has strengthened his dedication to donating blood. He believes that there’s no greater gift than the gift of life and that is why he gives blood on a regular basis. For me the reality of the need for blood and the shortage in the country hit home when I attended the launch of the Barclays Bank blood donation drive dubbed ‘15 to save a life’, a phrase coined from the above fact that it only takes 15 minutes to donate life saving blood. It was at this event that I learnt a few things in a topic that I’ll admit I’ve not kept so close to my heart, but that I intend to from now. As easy as it is to take things for granted when we are ok, I was shocked to learn that every 10 minutes someone needs blood. Considering the significant shortage of blood and Barclay’s wide reach in many areas in the country, the bank aims to add to add 1,000 units of blood to KNBTS blood banks. Blood donation is welcome not just from Barclays staff members, but from other partners and customers as well. This initiative is under the bank’s shared growth agenda, whereby it believes that with its growth, communities should also grow and benefit. With the #15ToSaveaLife initiative you too can join the cause through giving blood at one of the 30 Barclays Bank branches that will be hosting the KNBTS between 2nd and 11th May 2018. Take the opportunity to give your blood to save someone else’s life. Here are the branches you can donate.